THIS is one of an increasingly numerous class of vessel constructed in recent years for all long haul routes. She has several interesting points; in particular, high power arranged on a single screw, and a special hull-form with a curiously raking bow. Known as the Maier-form, the latter is primarily intended to increase speed, without increase of power, and to improve the weatherworthy qualities. The Nora Maersk belongs to a fleet of twenty-eight steamers and sixteen motor-ships under the control of a well-known Danish shipowner, Mr. A. P. Moller. Completed in September, 1934, she has a deadweight tonnage of 9,300, and a gross tonnage of 8,225, her dimensions being 450 feet length between perpendiculars, by 58 feet by 39 feet depth. When fully loaded she draws 26 ft 5 in of water. Propulsion is effected by a diesel motor of Burmeister and Wain type, operating on the two-cycle, double-acting principle, having five cylinders, 24.41-in diameter and 55.12-in stroke. The total power output is 5,500 horse-power on the shaft at 110 revolutions. Her average service speed in loaded condition is about fifteen knots, and while “motoring” at this speed she consumes just under twenty tons of oil a day for her main propelling and auxiliary machinery. 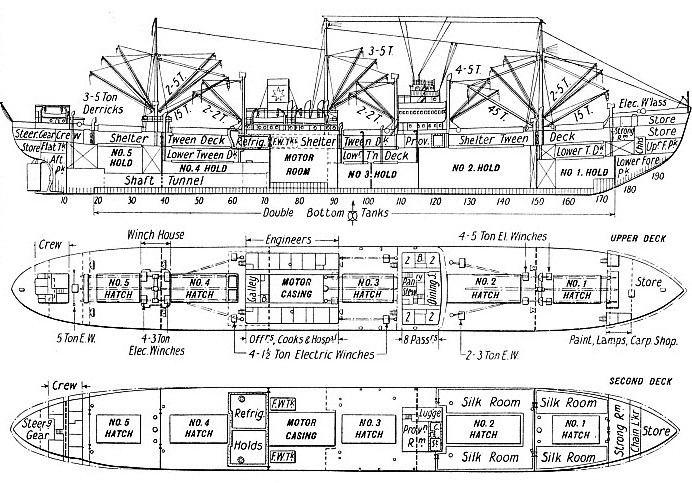 She is a shelter deck vessel - that is, one having a continuous weather deck all fore and aft, with a forecastle, a large navigating bridge structure, and accommodation for engineers round the motor casing. She has one complete tier of ’tween decks, with a second tier in Nos. 1, 3, and 4 holds. There are five holds, three forward and two abaft the machinery space. No. 3 hold is a deep tank, and is capable of carrying vegetable oils which are picked up in Far Eastern ports. The hatches are well serviced with derricks of five tons and fifteen tons type, and one of forty-five tons. A double bottom extends throughout the ship, and is specially high in way of the main propelling machinery. It is noticeable how short this machinery is in fore and aft length. The Nora Maersk runs from New York in trade round the world, outward by the Panama Canal and homeward by the Suez Canal. Occasionally she is engaged in transpacific trade to Japan, and for this reason has large silk rooms in the ’tween decks forward. The ship can also carry large quantities of fresh fruit from California in special refrigerated holds in the upper ’tween decks abaft the machinery space; these holds can also be utilized for transporting other forms of perishable cargo.